I recently had the good fortune of taking a trip to Delhi to participate in Pratham’s Joint Review Mission (JRM) to assess their work on the ground across India with a really interesting International team. After remarkable progress across many states in India, Pratham arranged this progress review with a view to continuous improvement, an aspect of their approach which is arguably a significant contributor to their on-going success. The READ INDIA programme has gained International attention due to its ability to teach basic literacy to children of any age in as little as three months. The programme has been developed and refined and adjusted to specific circumstances time and time again after the past years, and this particular review was particularly fascinating as it pertains to major strategic decisions of the organisation moving forward. One of the most remarkable things about Pratham is its ability to conceptualise scale, far beyond anything I have seen in SA where scale in development is somehow seen to be the antithesis of quality (a ridiculous sentiment). The organisation seems to understand the need for change to happen holistically and broadly for it to engender the underlying cultural shifts required to make that change sustainable. It is through this approach, that government partnerships have been sought, a series of programmes have developed in an interdependent way where complex incentive structures of providing education to volunteers (Education for Education Programme) ensure a holisitic development roll out, and teachers and district education members are brought into the work to transfer the agency around the change. Yet still Pratham finds that the challenges of working with government, the contrary time lines of government elected officials for limited terms and development workers with a long term interest and requirement, and the lack of interest, often from parents themselves to take ownership of the programme mean that the goals first sought might have to be revised. It is sobering indeed, that this work which is honestly nothing short of sheer brilliance has been so compromised by circumstance that the organisation is now seriously considering down scaling, and moving toward once off, high intensity type work, rather than on-going development support. Thus, the challenges we face in implementation are precisely the same, and there is one overarching question which, until answered, seems to obstruct so much. It seems that change cannot happen, unless people want it to. The question of how to transfer agency and to help individuals to take ownership of change remains. It was with these thoughts in mind, that I was assigned to team Bihar. Bihar is the poorest province in India. Enigmatic India. This was the 3rd time I have visited India and the country continues to amaze me. There is nothing quite like the culture of Indian life. We saw so much in the time spent traveling the rural areas of Bihar that to get it all down would take a novella, but in short, Pratham’s transfer of literacy skills is exactly what it claims to be; high quality and totally effective. Over the 3 day period spent traveling Bihar, we visited a series of learning camps, each at a different stage, and the progress being made by these children was incomparable. I thought for ages about the impossibility of motivating children through some kind American Dream type aspiration in a country with a population of 2.5 Billion and very little chance of progress. Indeed, these miraculous little beings seem to learn for the sake of it and rattle out their 12 times table with confidence and understanding and complete complex long division problems with unshaking little fingers. School after school uncovered confident little readers who told staccato little stories in Hindi following those same fingers across the pages. And curled up little children, chalk in hand, cover the floors in story mind maps as they tell tales of their uncles and aunts and the seasons and the gods; words, then sentences, then whole stories all proudly finished off with great gusto as the Sanskrit lettering is joined at the top with a not very straight line. Yet day after day, government offices of various shapes and sizes (and rank), and meetings punctuated with ceremonious chai astonished me with their failure to grab this thing and own it right away! Except for one District Magistrate, in the rest, we were met with the usual kind of well-rehearsed bureaucrat’s answers-to-everything and then bid a fond goodbye where the futureless truth made us all hesitate, momentarily in the doorway with our confused and stifled “but sirs” in hand. It is difficult to arrive and to try to advise something which is so deeply well informed, however basic aspects of demand creation came forward again and again. It can be argued that to gain the full government buy in, the aim might be to persuade the one group around which government base their plans – the voters. The failure of government to address the education needs of the Indian people, by failing to take the most major player in capacity and education development seriously shows that there is not nearly enough power being exercised by the general public. Indeed this is a global problem, but one which is beginning to come strongly to the forefronts of debates, and indeed the front steps of government buildings the world over. Perhaps the answer lies in inspiring the public to take charge of their own destiny, to own their futures and to unite to achieve the outcomes they need. Whether increases in living standards are derived from free markets or government aid, it is clear that neither leaves any room to the expression of the poor anymore. Governments don’t fear their electorates any more than business fear their contracted labourers and this is a recipe for nothing other than developmental failure. A strong case for public advocacy arose out of our group discussions and for putting a conception of personal power back into the hands of everyman, hopefully sufficiently so as to create the demand for public services which might shift the narrow and short term goals of government onto a path closer to that of an individual – into the context of lifespans and generations and real long term progress. 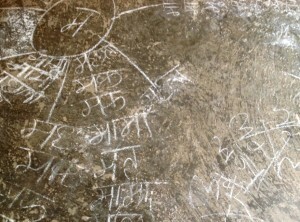 Pratham is loved and little Pratham logos painted on crumbly walls everywhere shows that the integration is happening, the wheel is in motion. The CAMal methodology, grouping by ability rather than age, and sincere and committed academic support are indeed yielding great success and significant learning gains. 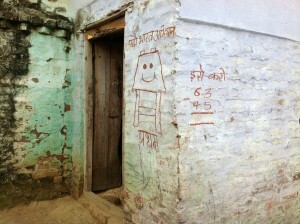 And gradually, as these children go home full of stories and newly empowered, the message is sinking into family life. Literacy is becoming an important topic in development discourse and in the public debate in general. And there, as here, if we can all unite in stressing the importance of demanding high quality education for all to those with the power, the voters, then the potential for change is real. The trip was fascinating from start to finish and every school door opened revealed the most fascinating secrets of how people work, and how we can translate this to sustainable change. Thanks DGMT for a really inspiring experience and one I hope will remain in mind as grounds for comparison as I embark on supporting similar work within SA.